This course is intended to be a landmark Orienteering Course. A compass can be used but is not suggested. The object is to find the control points and record the letters that will be found on these points. The course is setup in two sections. Control points 1-12 are for beginners (cubs, junior scouts) and control points 13-32 are for more advanced hikers (senior Scouts, find Venturers). The junior course should take about 30 minutes, the senior about 2 hours. 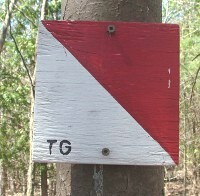 Control points are marked with 15 x 15 cm red and white squares mounted on trees. Each marker has a pair of letters that will be recorded on an answer sheet. You can start at any point and work your way around the course. You can run the course with or without scoring. The letters will be changed on occasion so if you are planning on using the course be sure to get a current answer sheet. Only experienced hikers should complete the course alone, we suggest that the course be completed in pairs or in small groups. Included in your package is a point structure for the course. This can be used on its own, but is most effective if used in conjunction with a time limit. Place a limit of three hours for the whole course. If course is completed in less than two hours add 5 points for each 5 minutes before two hours (bonus points are awarded only if course is completed correctly). For each five minutes over two hours deduct 5 points. (Maximum 3 hours-60 points) Participants must now decide which points to collect to get the highest score in the time allotted. (More difficult control points have higher points). This builds outdoor, leadership, team and decision making skills. Note: The course and materials are courtesy of Marty Albert. For the answers, please contact us!